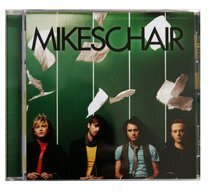 To say that Mikeschair is simply an "experience" is a serious underestimation. The combination of Grayson's warm vocals and violinist Jesse Hale's signature strings creates a unique atmosphere in which the group's collaborative songwriting efforts can brilliantly shine through. If that weren't enough, guitarist Sam Tinnesz' rock-based hooks, Jon Haire's accomplished bass abilities and Seth Jones' inventive guitar/keys contributions make it easy to see why the five freshman went from Belmont's dorm room to Curb's reputable roster so quickly -the music easily holds its own next to veteran industry bands.